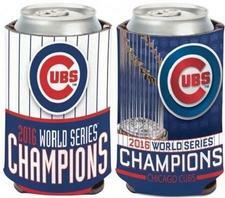 MLB World Series 2016 Chicago Cubs 12 oz. Can Cooler - $4.99 - GolfersEdgeOnline.com - Best Golf Equipment On The Web! Full color imprinted 12 oz. can cooler with an imprint area of 4" x 8" made with 1/8" neoprene. Made in the USA. Great for any occasion! If you have any more questions about the MLB World Series 2016 Chicago Cubs 12 oz. Can Cooler; do not see the model you are looking for; need custom options; or prefer to not purchase online, then please call us at (630) 656-1291.